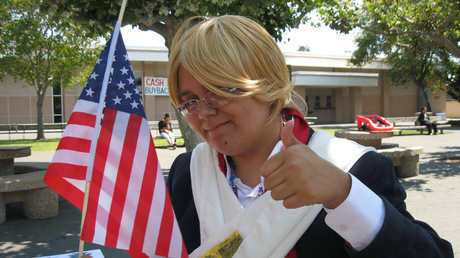 So onto the topic: Has anyone here cosplayed as any hetalia character in the series? I'm really curious to know! What about you guys, plz respond! I'd really like to know! I'm going to cosplay as France! the hore! and my friends are all doing it too! were all going to be Hetalia countries!! I'm sooo excited about it! My friend wants me to cosplay as Russia and drag me to a con but im not allowed too.... >:/ RAWR!!! i've cosplayed as Austria to school while two of myfriends were Russia and Hungary. Fun until oter students call you mean names. totally worth it though. goo times. I'm going to cosplay as England for halloween and National Hetalia Day! i did a really bad iggy cosplay for Hetalia day this year XD lol i had cat ears..